Firstly is the question of agency. What do you mean not overly familiar with Schroedinger's Cat? (Gasp of disbelief). Where have you been, locked up in a box for eons? Well I'm not going to devote time and space and spacetime to filling you in on old ground here and now. Not least because I'd be breaking my promise to myself. Look, just Google it alright? If you can be bothered. or maybe you'll just pick it up as you read along here. 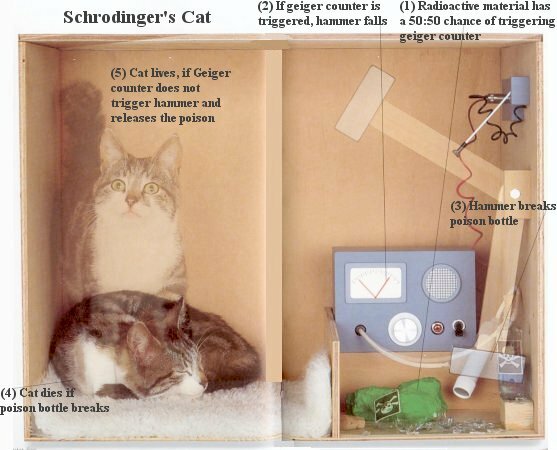 Basically a cat is trapped in a box, with a trigger mechanism that can release a poison or not, depending on the decay of radioactive material in the mechanism. The cat is alive inside the box, but cannot be said to have any existence because i) you don't know that it is alive as you have no confirmatory sense data, the solid steel box being impenetrable to light and sound-proofed so you can't hear anything from within and ii) the cat has no 'quality' of life to match the concept of existence, though this concerns moral and value definitions rather than scientific ones. Only the act of opening the box and supplying sense data determines whether the cat is alive or dead. Liberating the cat into existence, or burying it with full scientific honours. The problem of agency arises in any claim that the act of opening the box either kills the cat or frees it into life, because until that point the cat had either and both potential outcomes ascribed to it. Errant nonsense. You opening the box may confirm the single state of the cat hovering between life and death, but it didn't cause that outcome. If the mechanism was rigged up so that the act of opening the lid triggered the radioactive device to decay or not to decay, then you opening the box could be said to confer agency upon you. Although it was still not something you were fully in control of, seeing as you can't control the way the radioactive substance decays. Let's say the cat does indeed die at the moment of your intervention. Yet your act was a well-intentioned rescue act, which ended in a calamitous way like the ATF at Waco or Russian Special Forces at Breslan. Catslaughter at worst. Don't think too many courts would convict you on that count. Let's face it, the true agent of death in this particular scenario, would be the person who stuffed the cat in the box in the first place. A box with finite air and no food, so poor puss was going to snuff it eventually one way or the other even if no sap ever opened the box. Not only that initial spitting in the face of animal welfare, but then to rig up a fiendish poison mechanism and double bubble, the irradiation by decaying isotopes? Talk about overkill. Definitely showing intent I would say. Pre-meditation, whereas any plucky would-be rescuer would be acting on the spur of the moment and manifesting compassion. However the conceit gets worse. This thought experiment (aka the wish-fulfilment of a cat sadist, the well-known early behavioural symptom of the psychopath), is supposed to demonstrate the notion of two simultaneous and yet contradictory states of the cat being both alive and dead. Poppycock. The cat is either alive or dead, dependent on the radioactive decay. We are just not privileged to know which because we are sealed away on the outside. While I concede that it is a nifty little model on the participatory role of the observer, he who lacks any sense data is all adrift at sea and that the mere act of observing and corroborating the fate of the cat shapes an outcome different to one where we never opened the box and remained unenlightened. If the "observer" manages to contain his curiosity and or concern and never moves to open the box, whether the cat is alive or dead, it remains trapped. De facto killed by its captor, be it poisoned, asphyxiated or starved to death. Curiosity can save the cat, but it can't kill it. The two outcomes, of live cat, dead cat, are both certainly possible. But a state of unknowing, of hovering between the two, does make the two states coeval with one another. Beyond the possibility of either, until one is affirmed and the other dismissed by evidence. We are not presented with a split in reality according to two alternative outcomes. "The cat lives, the cat lives" throwing a celebratory party reuniting it with its relieved owners, or if it were a stray originally press ganged into boxy service, releasing it to creep off back to feeding off the contents of Council waste bins. Meanwhile, in an alternate reality, the dead cat is extricated from its box by a technician wearing full protective radioactive suit and gloves, unable to be handed back to its grieving owners for fear of contamination, unable to be buried in the back garden for fear of the same happening to their row of carrots, or again if it was a stray, it couldn't be safely thrown into the same Council waste dumpster as its luckier version was able to feed from. So the world supposedly splits down these four lines. Alive cat returned to owners, alive stray skulks off to have a party of one, dead cat and grieving owners, dead cat with no one to mourn its passing. Then there are further splits and further parallel worlds. Maybe one where the unwitting cat-killer (he who confirms to the world the extinguished cat by being the one to take the decision to open the box and attest its fate therein), goes home unmoved by his failure to prise puss to freedom by acting in time, not permitting guilt to stricken him since he is secure in his knowledge there was nothing he could have done to change the outcome. As against the variant of the man, whose whole upbringing has differed sufficiently to burden him with guilt and remorse. The former incarnation pours himself a single scotch to swig away the slight aftertaste of the whole endeavour, to leave him fresh for what challenges next day has to throw at him. The second version takes to his bed with the whole bottle of scotch, or possibly even in his alcohol fuelled preoccupation, he swears revenge on the real criminal mastermind behind the slaughter of the cat, one Dr Schroedinger. (Guess which of the two adumbrations most closely resembles mine? Thanks author! Thanks for nothing). Dr Schroedinger no doubt sat there in his throne of power stroking a fluffy white Chinchilla in ironic aping of Bond villain Blofeld. And in whichever one of these split versions I find myself, well we know which one really don't we, I place 5 slices of pastrami into my (hero to zero) sandwich, while horror of horrors another split in the fabric of reality occurs as in a further rendering I only lay 4 slices of the peppery beef brisket. And so the realities keep on splitting and dividing endlessly with each momentous (or at least each peremptory choice between alternatives) decision made by every single one of our planet's 6 billion inhabitants. With further bifurcations when their decisions impact on other individuals who are also weighing their options and so on exponentially. Too many alternative realities? Too many for one single brain to hold that's for sure (that's you snookered author). Any alternative could exist, but like the alive/dead cat, it doesn't mean it does exist. (Other than in differing subjective versions of parties involved, take a couple breaking up argument, you'll get two side-by-side utterly distinct versions of that conversation, the 'truth' probably being somewhere between the two. Even if you recorded it and played it back, the listener's own stance on the subject of gender, relationship and the like would colour their hearing of the taped evidence). The observer (listener) affects what he/she observes? You betcha! Making a decision may close off an alternative and kill off a whole potential world of causal chain and effect from ever existing. Unwitting genocide? Of course not, the citizens still exist in our world, even if not quite in the same way as they would have done in the alternate one. Perhaps reality and logic operate on an inbuilt hierarchy of decisions. The decisions that affect the greatest number of people maybe determines which of the alternate worlds survives into reality and which are cast into the abyss of non- and never existence. That my pastrami slice options don't materially weight heavily enough on the world to open up a whole new strata of it. Whereas if I took my foot off the break pad and crashed my car into this house, it probably would. Unless an earlier decision had removed the occupants down to the bingo or visiting an elderly aunt in the hospice. Then it would only be my lights put out. And while my perceiving consciousness may be extinguished, the world would carry on turning. The couple would come home from their bingo or hospice visit and be somewhat inconvenienced by having to pay for a new front wall. And in doing so they might consider whether to embed glass shards in its surface to stop elderly pensioners sitting on the wall to catch their breath while struggling towards the bus stop thirty yards further up the street. Which might resonate with the fact they had just visited an elderly relative in a hospice, or slightly earlier versions at the bingo. Or it might not and the irony would be lost on them. But I digress, which is understandable given that I die in this scenario. Had my professional security procedures permitted me to park directly outside the house I'm scrutinising, then it might have been the two-timing couple inside whose lights I ended up eclipsing. But that's a whole other story. An alternate reality if you will. So there appear to be unintended consequences and random factors aplenty, which makes having all the information at your fingertips hard to gather, but does not rule out the knock on of cause and effect in some sort of sequential order. There is not any parallelism of different outcomes, both of which exist simultaneously. So what have we learned? That quantum mechanics is an elegant set of mathematical equations, but bear no useful insight into material reality. The problem of Heisenberg's Uncertainty principle, is that straight away the observer is talking in terms of probabilities. Because he cannot locate with any certainty the position of a particle, he expresses it's likely position through probability equations. But probability is maths not physics. It is imminence not substance. How we can then derive possible and probable scenarios for events and glom them on to reality is a leap too far. Outside of the creative imagination, or varying subjective perspectives, different versions of the same events and outcomes cannot exist simultaneously. And even the creative imagination is limited by just how many versions it can hold in mind at one time. While differing subjectivities either render any event meaningless because of a lack of consensus as to what constitutes the reality of it, or any such consensus flattens out the picture and will in all likelihood omit troublesome data that doesn't quite fit in with the picture. The parallel reality artists like to argue that a myriad of alternative worlds can coexist on some sort of matrix, because all reality is one, long, uninterrupted woven continuum containing everything. The differing versions of the same thing merely occupy different points of the membrane. Some will travel along its path and discover it, while it will remain forever closed off to other consciousnesses unaware of it. The problem with such a theory, apart from its echoes with certain Eastern mystical theologies about the connectedness of all things, is that we are each propelled into this world with selfhoods that dissociate ourselves from other mere mortals as much as seeks to make connections between us. We are overly concerned with our own lives, our happiness and wellbeing and avoidance of discomfort. Our brains may share many things, from learned knowledge through to perceptions and interpretations of a broadly shared reality, but they tend only to concern themselves every minute of every day with the bundle of matter they come attached to and in charge of steering and fuelling and maintaining. Our brain cannot know what it doesn't experience (and remember reading or hearing about something makes it part of our experience). Therefore the brain cannot conceive a reality outside of itself. All of its hard wired and acquired notions that help it function reasonably adroitly in the physical world, contribute to shaping how it perceives reality. It cannot explain the world without resorting to its assumptions made about the world and that it lives by every day.